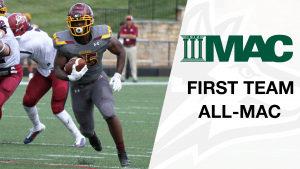 Annville, Pa. (Nov. 13, 2018) – Alvernia University Football freshman running back Malcolm Carey earned First Team All-MAC, as announced on Tuesday by the Middle Atlantic Conference. Carey is one of just four freshman to earn the honor, and is the only freshman to earn Offensive First Team honors. 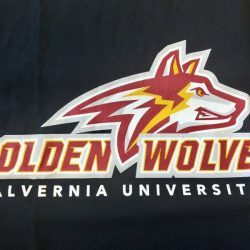 Carey led Alvernia’s offense, and was second in the MAC, with 102.3 yards per game. He scored 12 touchdowns on the year, and was fourth in the MAC in total touchdowns and points per game (7.2). Carey rushed for over 200 yards on two occasions, with 230 yards against Misericordia and 252 yards against University of New England in the season finale. Carey also posted five touchdown for the Golden Wolves against Misericordia. The running back also averaged 7.27 receiving yards per game for Alvernia. Misericordia quarterback Brady Williams was named Offensive Player of the Year, and Delaware Valley defensive lineman Michael Nobile was named Rookie of the Year and Defensive Player of the Year. Misericordia Mark Ross was name Coach of the Year.